Although perhaps not traditionally contextualised together, food and art commonly occupy the same environments. 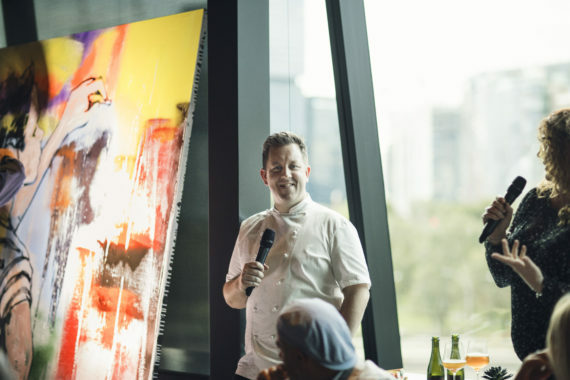 Food is represented in art – or even as art – in both the gallery and restaurant. To speak of food and art is also to bring about their similarities as potential sources of enjoyment, fulfillment and creativity but also as being instrumental in satisfying personal and cultural tastes. Looking back food has always played a role in the history of art in one form or another: Stone Age cave painters used vegetable juice and animal fats as binding ingredients in their paints and the Egyptians carved pictographs of crops, food and wine on hieroglyphic tablets. During the Renaissance, Giuseppe Arcimboldo painted playful portraits in which facial features were composed of fruits, vegetables, and flowers. In the Post-Impressionist era we find Cezanne’s renderings of apples and oranges. Picasso famously used his paintings as payment for his dinners at La Colombe D’Or and during the pop art era food became a social metaphor for issues like rapid modernisation or increasing gender equality. At Dinner our walls don beautiful still-life pieces that could be reminiscent of those of the Dutch Golden Age and its influence on British art. Every element, down to the last leaf or piece of fruit, is carefully rendered to create the illusion that the feast is sitting right in front of the viewer. In the 1600s, these paintings were a symbol for the owners’ wealth and intellect and the foods depicted had symbolic significance. 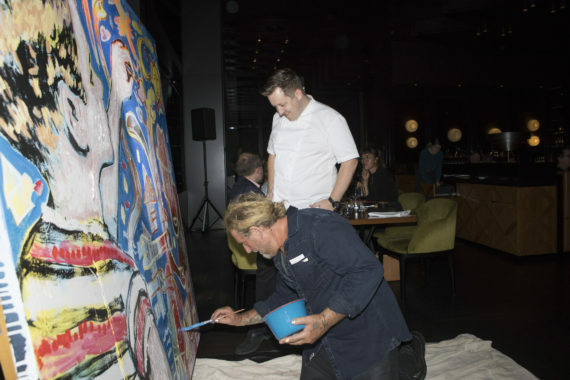 During Melbourne Food and Wine Festival we held a series of two dining experiences with artist David Bromley and hosted by Ashley Palmer-Watts to exemplify the companionship between art and culinary experience. David Bromley began his career in Adelaide as a potter, but is now best known for his sculpture, portraits, and paintings of children, birds and butterflies. He has exhibited widely in Australia, and also in Asia, Europe, Africa and America. He is also known for collaborating on creative visions with people who are equally as hard working and passionate about their craft. 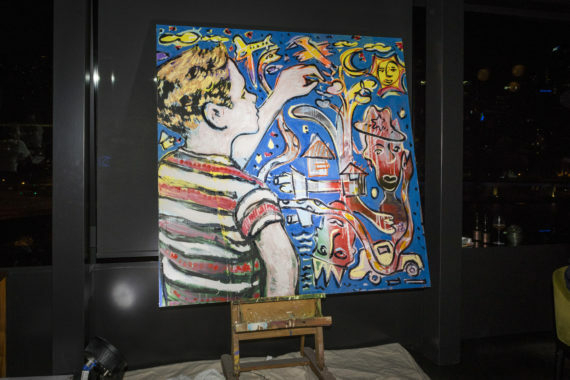 On the evening while guests dined, observed and were encouraged to participate in the creation, David painted a canvas to be actioned off for the Children’s Cancer Council. He and Ashley discussed their beginnings and similarities. “I feel comfortable working with Dinner and Ashley; there is not a single person there who is not passionate about their craft. There are parallels between what we do; we both have that twinkle in our eyes”. David read all he could get his hands on; fairy tales as a child, sci-fi growing up and then about artists lives when he was older. With no formal education, he decided to commit himself to a more expressive life and apply himself to a discipline and his chosen one was art. David started going to the pottery stalls of local markets, took a couple of classes and enquired about vacancies. Before he knew it he was firing a kiln and then moving on to canvas to evolve into the artist he is today. We can see similarities between his beginnings and those of Ashley. 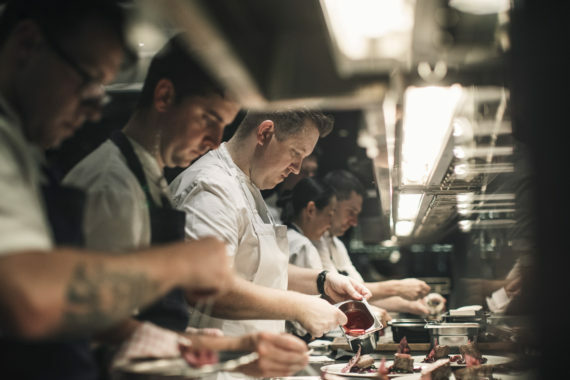 Originally from a small town in Dorset England, Chef Ashley Palmer-Watts began his culinary career like many others: working for a local restaurant at 14 years old. In 1999 after eating at the Fat Duck with a friend he decided he wanted to work there more than anything. From there he did stages, unpaid internships, everywhere from Le Manoir aux Quat' Saisons to Gordon Ramsay's Aubergine, which even offered him a job. But it was the Fat Duck he wanted, so he went to work on a friend's watercress farm, while he waited for a vacancy. He called every day to enquire about a vacancy until finally one day there was one. He often describes it at feeling like it was meant to be. The definition of art is ‘something that is created with imagination and skill, which is beautiful or expresses ideas or feelings’. This definition comes to life in these two people, both artists in their own right. David’s medium is canvas, bronze, ceramics and even interiors. Ashley’s medium is the restaurant itself, creating the environment in which to present his masterpieces: his dishes. Both produce beauty and in the expression of their arts their aim is to inspire happiness in all those who interact with it. From the humble coffee cart in galleries or museums to boutique dining experiences, food culture is playing a growing role in our cultural spaces and also vice versa; the combination of art and food culture provides new opportunities for guest’s experiences.